The current study aimed at identifying the impact of the Brain Keys Program implementation on the creative thinking development. Therefore, the study adopted the experimental approach by using the experimental and control groups design. The study sample consisted of (159) individuals from the community, (78 women- 81 children), were intentionally chosen, and divided among two groups, the experimental group consisted of (40 women -43 children) who have been applying the brain keys program, and the control group consisted of (38 women -38 children) who have not been applying the brain keys program . 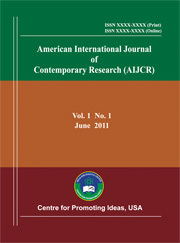 In order to achieve the objectives of the current study; two tools were used, the first one: brain keys program of (Meshaal, 2011), and the second: Torrance Test for Creative Thinking (Torrance, 2001), which verified the validity for both tools, and the reliability for Torrance Test, and then they applied both of them on the study sample. After the data analysis was used through using SPSS; the study results showed that there are significant differences in the mean results concerning the children and women sample tests at the levels of flexibility, originality and details concerning the creative thinking test in its formative forms (A and B), attributed to the application of the brain keys program, these differences tend to be in favor for the experimental group. This indicates that there is a statistically significant effect at the level of significance (α ≤ 0.05) for applying the brain keys program at the levels of flexibility, originality and details concerning the creative thinking development on the Torrance test among study sample. This result revealed the positive and effective effects of the brain keys program, which raised the level of creative thinking among the study sample. The study recommended to encourage and support the students to use the creative thinking in their Learning process and problems solving, in addition to working on the brain keys program by using the generalization among students at all academic levels, including schools and universities.